The Black Swamp Fantasy tournament, hosted at Bowling Green State University, kicked off the fantasy season with a novel drafting premise. But the tournament shone not just in novelty but in execution as well, with a fun but competitive nature, a smooth running schedule, and beautiful weather. The way that drafting worked was that in each round general managers got to choose a position and a number. The number referred to a random player at that position, who was then added to the team. Following the draft, each GM was allowed to make trades, with no rules or limits to what they could do. But instead of focusing on overarching reviews of each team, I thought that, this early in the fantasy season, it’d be best to focus on some lesser-known players that stood out on the pitch this weekend and could be difference makers in tournaments later in the summer. Rupp is an absolute tank. I have played against him during the school season, but Devon McCoy, who is largely a similar player, has always overshadowed him. Playing against him at this tournament proved to me that he deserved some recognition himself. This tournament featured quite a few hard hitters, including Dylan Schepers, Eric Wasser, Travis Fannin, Gabe Unick, Mike Pascutoi, Malek Atassi, Andrew Axtell and McCoy, but, of all those names, I can easily say that I felt Rupp’s presence on the defensive end the most. He hit early, often, and hard. On the offensive end, he ran through defender after defender for easy scores. 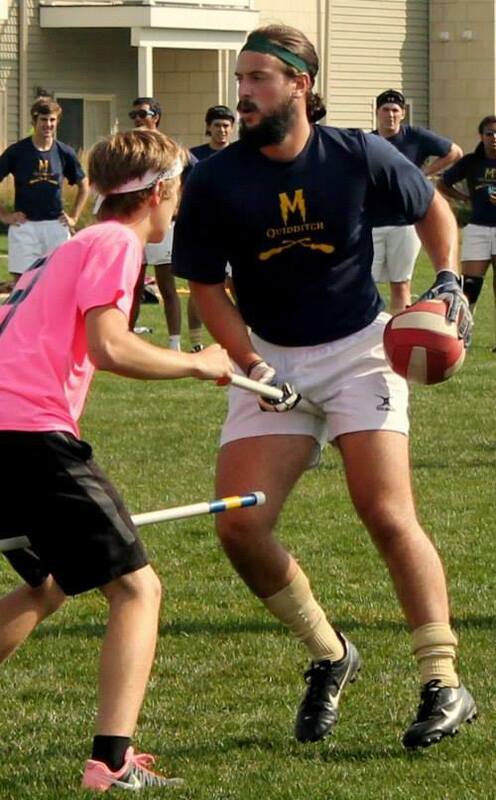 All in all, Rupp is a solid player that will definitely be turning heads this season with McCoy moving on to Blue Mountain Quidditch Club. Take this in: Fannin is 6-foot-5, 240 pounds, and that is basically just his beard. Fannin is an a behemoth on the pitch and he’s making huge strides towards being more consistent as he gains more and more experience. Unfortunately, he was knocked out of the tournament in their second game when my heel caught his nose – sorry again Travis! – but before that happened he was really getting a chance to shine in a big role on an overmatched team. I would have loved to watch him be able to get more minutes in such an integral role, but, nonetheless, he should be a big contributor for the Buckeyes this coming season. Unick was the most efficient seeker at this tournament. He didn’t have the best track record coming in, those merits go to 2012 Team USA seeker Tyler Macy and 2014 Team USA seeker Sam Roitblat, who were both in attendance, but he caught every snitch, and he did so quickly. There would be times where Roitblat, who was on the same team, would come up short on a lengthy shift, only for Unick to catch it within the first few opportunities. On top of his seeking excellence, Unick played great on point defense and above average as a wing chaser on offense. There’s no doubt his utility was vital to Taylor’s team’s finals run. Another member of Taylor’s Orange Team, Schepers was the best beater on a team that many originally said was weak at the position. When Schepers was in, he physically dominated the opposition and controlled every aspect of the game. Michigan has always had solid beaters with Zach Schepers, his twin brother Dylan Schepers, and Lisa Lavelanet, and they will continue to be a force to be reckoned with in the future. “K-Pack” is back, and in a big way. After taking two years off – outside of the occasional fantasy tournament, Packard will be joining BMQC for this upcoming season. The biggest question mark facing the newfound team, aside from the typical community team problems, is where they will get female production from. Packard answered the question loud and clear at Black Swamp outperforming all but one or two other female chasers. I didn’t see her much, but when I did, her performance jumped off the pitch. To paraphrase David Hoops, he was excited to see how BMQC players were looking this tournament, and, largely due to the way Packard played, he came away very impressed. Though Andrew Axtell is graduating, Malek Atassi shows promise in filling his shoes at Michigan. Atassi is a defensive force. He has a strong body and can take down anyone. He doesn’t have the greatest lateral quickness, but as long as there’s a beater around to keep the ball carrier honest, Atassi will easily take himdown. On top of being a good defensive player, he also can barrel through a lot of defenses. Along with his ability, he has the wherewithal to know when to drive and when not to. Beaters must stay alert when he has the quaffle. Although he doesn’t have the pure athleticism or speed that Andrew Axtell has, he should fill in nicely for Michigan next season when given a larger role. 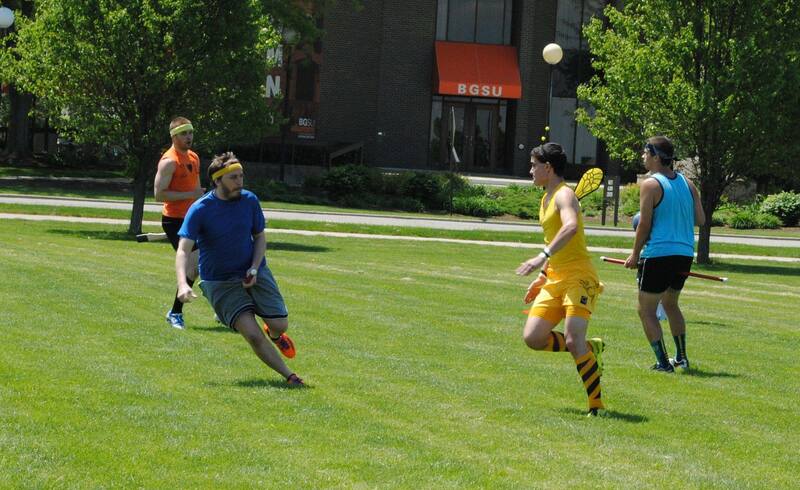 Somehow, Slutzker has found a way to go under the radar while playing quidditch for nearly four years. She started off at the University of Michigan, and has, luckily for me, found her way to Bowling Green for grad school. Her knowledge of the sport supersedes anyone that isn’t already lauded for his or her experience. Black Swamp was her first fantasy tournament ever, and it was a chance to see just how well she can adjust to a system, as well as to her value as a player. She is fearless and aggressive while always putting pressure on the opposing team. Expect analysts, including myself, to overlook her time after time this coming year while she continues to be a productive and integral part to Bowling Green’s beating corps. The region got a small taste of the potential Yost offers this past season. She is tall, athletic and extremely intelligent in her positioning and execution. She easily averaged two or three goals a game at Black Swamp while being fed by Andrew Axtell and David Hoops. While her offense was great, her defense was even better. Using her tall frame and basketball IQ, she shut down wing chasers on an extremely consistent basis. She may not be the best female chaser in the region, but she was the best on this day, mainly for the way Alexis Moody used her on the pitch. All of Yost’s skills were on display, and it was a strategy that Bowling Green will likely try to mimic in the coming season. To be fair, Hopkins never has gotten mentioned in the Midwest before now because he has never played in this region before this tournament. That being said, the region better be on the lookout for him next year. He is a conservative beater, but he plays the role exceptionally. He, with the help of beater partner Julie Fritz, could retain bludger control better than anyone at this tournament. Doing so helped keep games close, and no one pulled out of snitch range on this team until Orange Soda learned to capitalize on the conservativeness of the beater duo. If BMQC puts an aggressive beater out on the pitch with Hopkins, expect them to make a lot of noise in the 2014-2015 season.